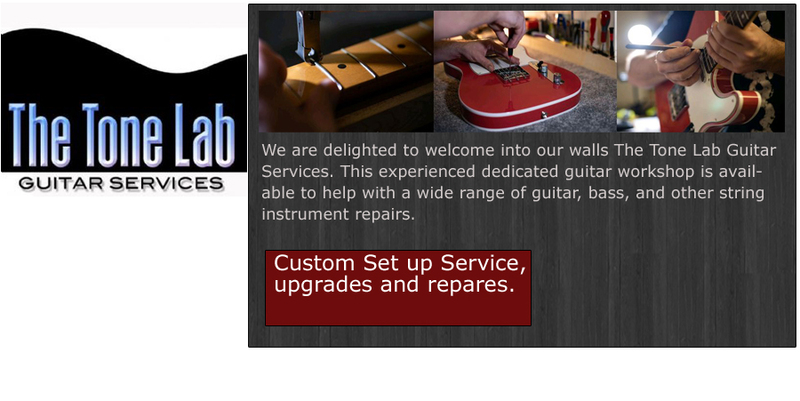 We are delighted to welcome into our walls The Tone Lab Guitar Services. This experienced dedicated guitar workshop is available to help with a wide range of guitar, bass, and other string instrument repairs.This includes simple string changes right up to complete re wires, fretwork, and general guitar repairs. We have 3 benches with all the tools to repair and service your guitars and basses so they have a new lease of life! We aim to have most setups and services turned around in 5 to 7 days. Bigger jobs (re frets, re wires etc) take a little longer at around 10 days. Competitive Prices & Loyalty Discounts. Not only do we offer Competitive prices, We also offer loyalty discounts to returning customers! Prices exclude string cost. We have many brands available starting from £5 per set including Fender, D'addario, Ernie Ball and Elixir. Full Custom Setup including fingerboard clean and fret polish. Includes a full custom setup. Hand cut and measured for a perfect fit.